Chart of the week: Are you prepping for GDPR? Anybody doing business in the digital realm should be able to tell you what GDPR is. Spelt out, it reads General Data Protection Regulation and constitutes a major EU data protection law update, coming into effect on May 25, 2018. It's purpose is to “enhance the protection of the personal data of EU citizens and increase the obligations on organisations who collect or process personal data”. Meaning, this legislation does not just apply to companies based in the EU, but to all companies doing business with EU customers. It also applies to companies who aren’t selling goods or services but monitor user behaviour in the EU. All the more important that business executives make sure their companies stay ahead of the (legal) game and make their business GDPR-proof ASAP. 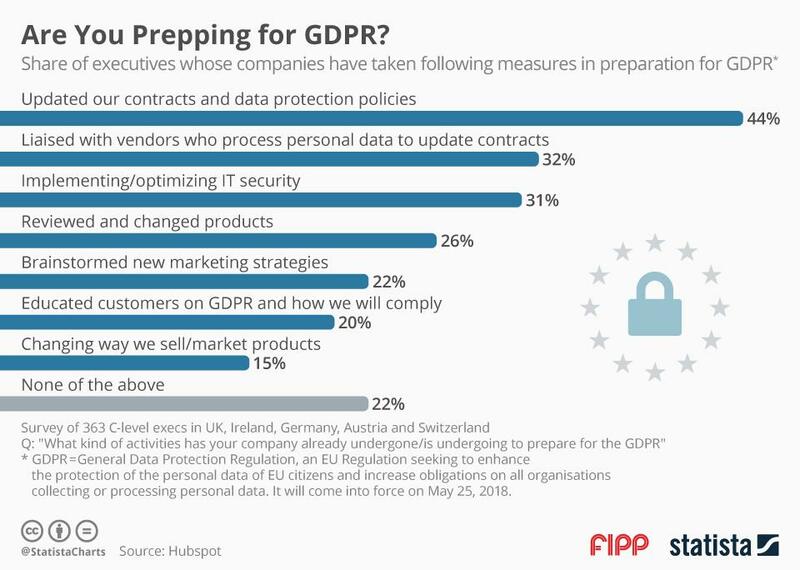 Marketing tool provider Hubspot asked 363 C-level executives in UK, Ireland, Germany, Austria and Switzerland what kind of activities their companies were undertaking to prepare for GDPR coming into force. Most of them, 44 per cent, were updating their contracts and data protection policies. However, 22 per cent ticked the ‘none of the above’ box, which of course could mean some companies are risking a rude awakening after GDPR day, as the EU has threatened heavy fines for those who don’t comply. Chart of the week: What are the risks to success for publishers in 2018?